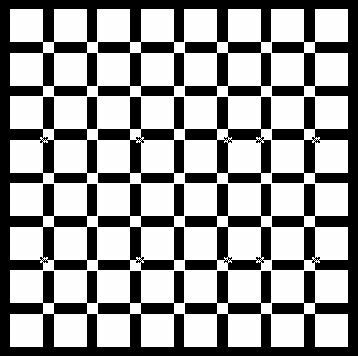 The applet illustrates what is known as White's illusion. The gray rectangle are of the same shade. The ones that appear lighter are drawn within the darker bands. The interesting observation is that the same illusion appears even when their longer sides are in the contact with the lighter bands. Somehow the background seems to stretch from left to right rather than vertically. Edward Adelson explains: "This effect has been interpreted in terms of the T-junctions. Patches straddling the stem of a T are grouped together for the lightness computation, and the cross-bar of the T serves as an atmospheric boundary. ... the action of T-junctions can be so strong that it overpowers traditional grouping cues such as coplanarity. Therefore the grouping rules for the lightness computation evidently differ from those underlying subjective belongingness." I am not convinced that the idea of T-junction is very much relevant to White's illusion. What works here behind the scenes, is the perception of a single item occluded by the longer and darker bands that lengthwise consists of 6 rectangles, not 3. The lightness of the perceived bar (i.e. the stem of a T previously) is obtained by averaging the visible parts and the occluding pieces. The cross-bar of a T does not appear to play any role in the effect. To check this, I create an applet where the dark and light bands are vertical rather than horizontal. The perceived distinction in the gray shades remains exactly the same. However, imagination sees no T resting on a side that could affect our visual perception.